The screw thread hold down clamp fits perfectly into any 20 mm bench dog hole. It makes an ideal addition to the Festool MFT/3 Multifunction table other grid tables with 20 mm holes. The swivel pad is a non-marring pad which will protect your work. The hold down clamp comes with a support ring, an M8 knob and a large washer. Parf dog holes and those in the Festool MFT/3 rely on their exact sizing to maintain accuracy. In which case, we suggest you secure it using the M8 knob and washer. The main part of the spigot, which sits above the surface, is 25 mm diameter. This precisely matches the 25 mm portion of your Parf dogs and the body of Parf Twist dogs. 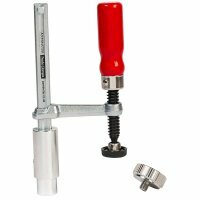 It allows you to use the clamp’s spigot as a reference, positioning and clamping a workpiece at the same time.